Please note that all eBooks are priced in US dollars. 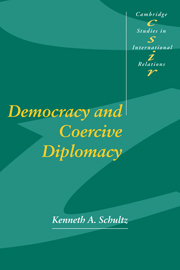 Schultz explores the effects of democratic politics on coercive diplomacy. He argues that open political competition between government and opposition parties influences threats in international crises, how rival states interpret those threats, and whether or not crises can be settled short of war. Compared to their nondemocratic counterparts, democracies make threats more selectively, but those they do make are more likely to be successful--that is, to gain a favorable outcome without war. Schultz uses game-theoretic models and tests the resulting hypothesis using both statistical analyses and historical case studies. 1. Introduction; Part I. Theory: 2. Information and signalling in international crises; 3. Democratic politics in international crises; 4. Domestic competition and signalling in international crises; Part II. Empirical Analysis: 5. Selective threats, effective threats: the initiation and escalation of international crises; 6. Credibility confirmed: the implications of domestic support; 7. Credibility undermined: the implications of domestic dissent; 8. Conclusions and implications; Appendices; Reference; Index.